The winner of the Hippocrates video giveaway can wait no longer. Jenny, it’s you. Email me your address ([email protected]) to get your gift! Fair warning: I may not do another giveaway for a while. I’m traumatized by my own negligence. A few days ago, a friend and I had a comically animated (OK, most of the animation was coming from me) conversation about Fuji apples. They are, we concluded, the best apples in the world. There are other great varieties (Macoun, Jonagold, Granny Smith) as well as some not so great ones (the offensively mealy Red Delicious), but Fujis have the perfect combination of sweetness and crispness. Blend all ingredients but the oil on high till well mixed. 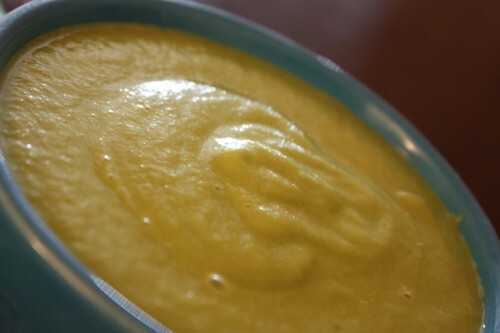 Add flax oil in a thin drizzle to emulsify the soup. Serve immediately, garnished with mint sprigs if you like. I wanted something equally summery to go with my soup, so I decided to make a berry dressing, which a couple of readers have requested. I’ve never really liked raspberry or strawberry salad dressings, which is why it’s taken me some time to comply, but it was hard to say no with a fridge full of strawberries that were destined to get mushy if I didn’t use them soon. 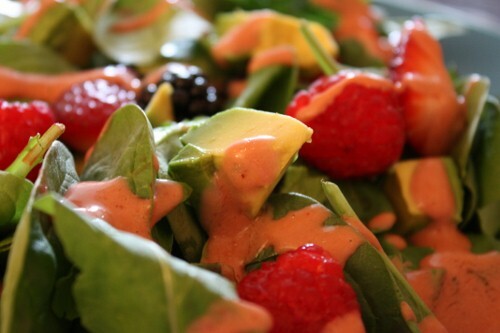 I decided to throw together a spinach, berry, and avocado salad and top it all off with a creamy strawberry dressing. I loved the results! 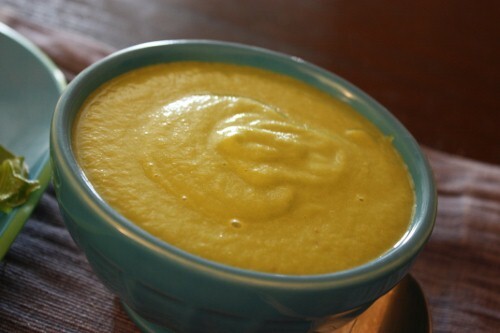 Blend all ingredients in a blender till the dressing is smooth. Serve over any salad, but in particular over the summer berry salad, below. Toss all ingredients with a few tablespoons of the blush vinaigrette and serve. 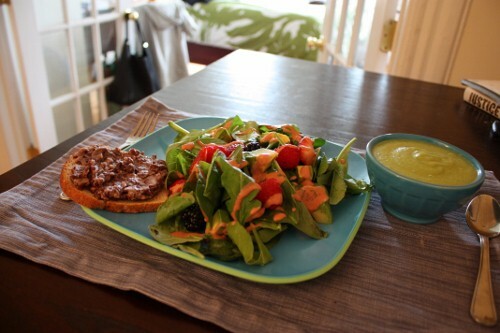 Together, the soup and salad were a perfectly light and refreshing lunch! I rounded the meal out with some leftover black beans I had (leftover from making Susan’s black bean and corn salad!) 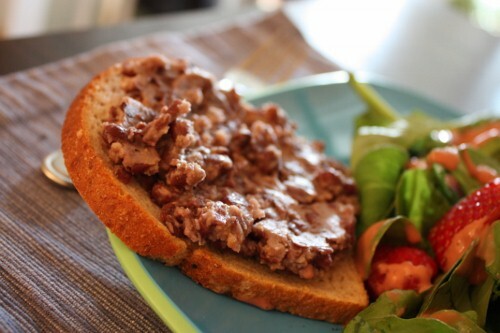 mashed onto some sprouted toast. There you have it, guys. Sunday lunch. I love using ingredients that are summery (berries) and autumnal (apples) all at once! I’m trying to think of a terrific question to end with, and I can only think of this: what’s your favorite apple? It’s hardly the stuff of philosophical debates, but we’re all foodies here. If the topic of Fujis can put me on the edge of my seat, it’s probably worth asking. Previous Post: « Bad Blogger. 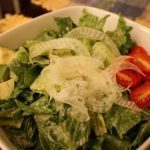 Fabulous recipes as always, Gena! Can’t wait to make both the soup and the salad. Looks like such a light, refreshing, and summery meal! My favorite apples, without a doubt, are pink ladies! They’re sweet, crispy, and perfect. I also like granny smiths when they’re super crispy, and honeycrisps! Loooks so good! But what if I don’t have coconut water? Thanks! Don’t sweat it. Regular water will be fine. I love Crispin and Ginger Gold the most but I generally love apples so I try to embrace them all (except the Red Delicious as you mentioned – what did they do to that poor apple variety?). The soup sounds interesting. I may give the combination a try in salad form this week. I prefer the Jonagold because of it’s semi-mushy texture yet still crisp and sweet. McIntosh are too mushy in texture but I find the Jonagolds to be one step up on the firmness scale and after discovering them for the first time last year, they rate around number one on my list (Braeburns being close by because of the same not-too-hard-but-not-mush texture). 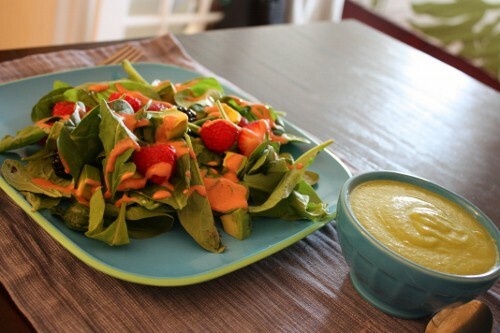 I like the dressing idea, I’ll have to give it a whirl if we can get ahold of some strawberries. I know *exactly* what you’re talking about, but I think you may have already hit upon the perfect choices. Personally, I go for super-crisp and super-sweet/tangy, à la Pink Lady and Jazz varieties, though Braeburn used to be my favorite. You have good taste. If you’re in a part of the country that can get them, check out some of the heirloom varieties, namely the Arkansas Black. I think you might like that one. Being a kiwi, I love braeburns and the red braeburns – mahano I think they are called, and I have been munching my way through bags of Jazz – they are great! Pacific Rose is also lovely for another taste/texture combo. They are still pretty good after that first ultra fresh crunch has gone, and great flavour. Hmmm, gala and fuji I guess, and I’m a sucker for red delicious also. 🙂 This recipes look wonderful, thanks! LOVE the Fuji, too! I can’t get enough of them this summer: Fuji + nut butter = total refreshment!Braeburn, Yellow Delicious, Granny Smith are also in my rotation. Not a fan of Red Delicious, either – you hit the nail on the head with the adjective MEALY! …and I’ve never liked fruity salad dressings, either. I like a tang to my salad dressing, not a sweet taste. I also like a fresh-off-the-tree Macintosh. Oh, Maine, how you spoiled me! Fugis are my all-time favorite. I rarely eat any other kind. Gotta be pink lady… there’s just no comparison! I think honeycrisp are probably my second favorite, but they seem to be a “hit or miss” variety of apple (I’ve had some incredible and some sub-par honeycrisps). The only two apples I don’t like are red delicious (mush) and granny smith (bitter + sour). But seriously, GALA APPLES ARE THE BEST EVER! A very crisp pink lady is my favorite! I used to only like granny smith when I was younger, but the Pink lady has the same crisp jucieness, with just a hint of sweetness too. *drool! My favourite apple is the honey crisp. Organic, of course. HONEY-FREAKING-CRISP!!! Best apples ever. That said, I’ll always have a spot in my heart for Gravensteins, as my grandparents used to have a tree of them in their yard; I have great memories of sitting in that tree with my cousins, munching away :). Perfect balance of sweet and sour, those ones. Agreed! I love New England Honey Crisps. Though Fujis are usually my second choice. honeycrisps and sweetangos (ridiculous name, but ridiculously delicious fruit). Love this post as I do with all of yours. My favourite apple is the Matsu, then royal gala. You must try the Jazz apple. Unfortunately, it’s not local. It’s a new variety from New Zealand, but they are Delicious! My daughter and I pick them up when ever we see them in the store. BTW, spinach and thinly cut apple slices are awesome as a salad. I’m sure it makes for a yummy soup! I agree – Jazz apples are great! And they’re not local to me in Australia either, but a little closer than some! I found NZ apples in the supermarkets in England last week and I was surprised. I am also partial to pink ladies, braeburns and galas. Depends on the particular crop though. I’ve managed to get mushy batches of all of the above at some point or other (including Fujis!). Thanks for the nice thing you said about JAZZ apples! On behalf of the JAZZ growers, I couldn’t resist chiming in. JAZZ apples are grown in several places, including the UK, France, Chile and Washington state as well as New Zealand. The Washington season begins in early November…in case that is a little closer to you? Come say hi at http://www.facebook.com/jazzapple if you’d like! My favorite apple is golden delicious. or pink lady. none of my apple trees have produced yet so I can only judge the store-bought varieties. Its hard to find organic apples they’re always sold out so sometimes … I cheat and buy regular. my #1 apple is also the fuji for it’s crisp/sweet balance! Red delicious GAG ME!!! bleah!!! the soft mealy action…soooo gross! No offense to anyone who likes them but I hate them! There are others like the honeycrisp or pink lady which are really crisp and I enjoy that but they dont have the same type of sweetness the fuji has. There are a zillion varieties of apples as we all know but yeah, the fuji is where it’s at for me too! I have such a weakness for Jazz apples. They can only be found in certain areas of the country (fresh and organic) so it is like a jackpot ever time I locate them! They are a perfect balance of sweet and tart. I had a raw soup at Grezzo once that had apples in it. I can’t remember what else was in it, but it was AMAZING. And this is coming from someone who is not a raw soup fan. I will have to try yours, though. Sounds delish. My favorite apple is also the fuji. How can you not love it? The only reason I don’t eat them very often is because they travel half way around the world to get to me, but they are just so sweet and crisp. I also love the pink lady, yum! Mealy, dry apples are SO gross. We used to get them as a kid and they almost ruined my apple eating days forever! My two fave apples are 1. Pink Lady and 2. Granny Smith (which is a very close second). I love the champagne-esqe flavour of the PL and the tartness of the GS. Fujis are good too though! 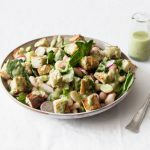 I love the looks of these recipes…I haven’t experimented with raw soups yet so I’m going to give it a shot! that soup looks great, might have to give that one a try! Apple and spinach soup I’m not so sure about, but that reminds me that I need to make your carrot/avocado bisque again ASAP. LOVE LOVE LOVE that stuff and could eat it every day!! Royal gala apples are by far the best. Although most kiwi apples are amazing, you should come try then Gena! haha. For real! And I want to taste these jazz apples everyone’s talking about! I am in California and was lucky to find them in my local Stater Bros. But they don’t stock them as often as I like. Very yummy. Hope you find some! This looks scrumptious! Another vote here for Pink Ladies–they are so beautiful and have the perfect balance of sweetness and tartness! haha, great to see I am not the only one who is super exited when the first apples of the season are in store! I’ve been looking forward since…april :-). Shouldn’t be long here, now. Looks delicious! 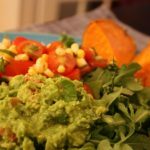 If someone has digestion issues and is trying food combining, would avocado and apples be a decent combination? Beans? Apples and avocado might be (it would actually depend on whom you ask), but definitely not along with beans. good to know — thanks!! WOW, your meal looks fantastic. I’m definitely saving this post for later. Pink Lady, or Braeburn generally and the English Russet apple in the autumn..
Hooray! Thanks for granting my request for a CR fruity dressing 🙂 Lucky for me my fridge is also full of strawberries, so I can try this soon! For best apple I have to go with honeycrisp. This looks delicious!! YUM! I could dive right in! “Offensively mealy”: what a perfect way to describe red delicious apples, which are also offensive because their name contains “delicious”! Seriously, what a scourge on the apple community. I actually grew up on red delicious–why my mom chose those over all others, I don’t know–I assume because it was all she knew. Shameful! But the day a friend’s mom handed me a McIntosh, I never looked back. I’m now a Gala/Fuji fan all the way. I put Galas in my juices. The best ones were in Japan though. When I lived there I would get these Galas that were seriously like, the size of a softball. Like you almost couldn’t eat a whole one in one sitting, and they were perfect, too (in Japan they don’t even bother putting imperfect produce up for sale). Can’t wait to try that soup! As for apples, I go with galas, yum! Ohhh apples, how I love thee…. My fave are probably gala, but I used to be a die hard golden deliscious girl. Can’t wait to try the soup!!! Oh please come to California :). You’ll forget all about Fujis in our apple world. The three best, in order, are varieties I hadn’t heard of until living here: Mutsus, Pippins, and Pink Pearls. Fujis are my favorite. 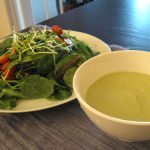 I would love to try this soup and salad out! Forgive me if someone already asked this in the comment section, but did you use fresh juice or packaged juice for the salad dressing? Sorry, forgot to ask this in my first comment. Do you eat this meal in any particular order (Soup first, then salad and toast or Salad first, then soup, then toast, or other order) or does it not matter? I love Pink Lady apples. Your salad looks soooo good! Order? No, I don’t think that it matters. Granny Smith. I like my apples tart and as crunchy as possible. For some reason I just despise mushy apples. Fujis are actually too mushy for me. i must say fujis are on the top of list of apples too! I agree. Fuji apples are by far the best!! I’m pretty new to your site and I love it. I tried the strawberry vinegrette last night and I love, love, love it! 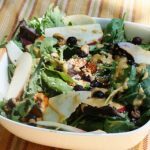 I am super picky when it comes to dressings and have probably tried 10 ir so recipes that I didn’t like all that much until I found yours! Had it on a spinach and romaine salad with mango, avacado, and strawberries. It was amazing. Thanks so much for sharing your ideas and recipes! Ahh everything looks so delicious! The texture of the soup, the colors of the salad – I just can’t decide what I want to make first! As for the apple, I’m a big fan of both fuji and honeycrisp! I would have to say that Granny Smith apples are my favorite. They are the perfect balance of sweet and tart. And I’ve never bit into a Granny Smith that was mealy. 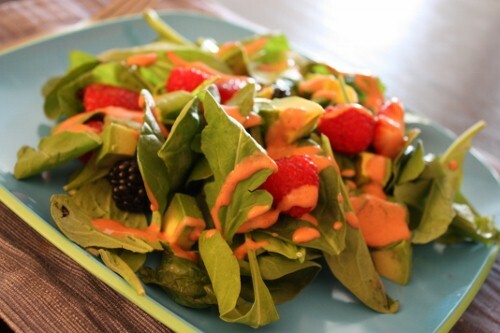 Love that dressing, going to try it out tonight (I have some strawberries that are about to go bad). WHOA I can’t believe I missed this question! If you can’t tell by my goofy WordPress identity: I. love. apples. My favorite is the Crispin/Mutsu (same thing) – particularly those sold at the Union Square Greenmarket. Big, cool, crispy, local and delicious. Amaaaazing meal. I LOVE the colors. I am all about Pink Lady, Honey Crisp + McIntosh. I put apple cider vinegar in every dressing I make. The huz is even hooked! I haven’t bought a jar of dressing in about 1 year. I gag thinking about ranch dressing now, lol. 😉 I need to make this meal!